Well I hope everyone is doing alright, It's strange to say I haven't been blogging for the past couple of days and that is because of my busy schedule that I've had which includes going on a much needed holiday up north in the countryside. The day before my little getaway I received a little exciting package from House Of Fraser. I quickly opened it like my life depended on it as I already knew what was inside. I still couldn't believe how the RIRI heats MAC Fall Collection was sold out on the MAC Cosmetics UK Site at 11.45am! I quickly went on there to purchase my goods and had to find a different route to purchase! Debenhams didn't have the full collection so I quickly tried Selfridges and House of Fraser. The collection had the Rose Gold Packaging and everyone knows how obsessed with Rose Gold so I was glad I held off on some of the items till now. Starting off with the Lipstick of course I just had to purchase Riri Woo Lipstick (£16.50) which has been said to be a darker blue toned than Ruby Woo. I don't have Ruby Woo but I have Russian Red and I thought Riri Woo was a great darker red for Winter. I always wanted a palette that's from a collection believe it or not and with the new palette packaging so I decided to get the neutral one called Her Cocoa 4x Eyeshadow Palette (£33) which is four Neutral Brown Shades that are right up my street. 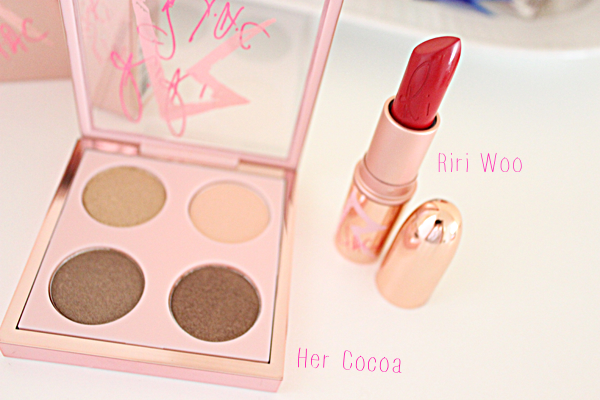 A Full Review on these will be up this week since I've had some time to play with these items! WHAT ARE YOU FAVORITE PIECES FROM THE COLLECTION? SHARE YOUR THOUGHTS AND LET ME KNOW IN THE COMMENTS BELOW!